United Tribes Technical College used National Sustainability Day, October 24, to raise awareness and boost participation in the college’s recycling program. For a number of years campus departments have recycled paper and plastic under the leadership of a small but committed group of faculty members. Two years ago, interest in sustainability grew when United Tribes President David M. Gipp signed the American College and University Presidents’ Climate Commitment (ACUPCC). The document outlines concerns about global climate change and offers methods for higher education institutions to model ways of minimizing the effects, showing leadership and integrating sustainability on campuses around the country. Institutions that sign-on commit their best efforts to pursue climate neutrality: By developing an institutional plan; initiating action to reduce greenhouse gases; and publicly reporting progress reports to the ACUPCC Reporting System. Spearheading the United Tribes effort is the college’s Green Committee. An informal ‘green committee’ existed on the campus for many years; its dedicated volunteers primarily devoted their labor to campus beautification. Now ‘green’ has a different hue. It’s work is directed from within the Student and Campus Services division and the members are tasked with addressing the substantial challenges associated with the climate commitment. The campus-wide recycling drive is one of their initiatives and is aimed at lowering the campus carbon footprint. Pitching in is United Tribes pre-schooler Kiiana Wells, 2, and her mother Shealynn Wells (Blackfeet), a UTTC Nursing student. Both took part in a campus-wide recycling drive October 24 on National Sustainability Day. Led by the campus “Green Committee,” the college is placing more emphasis on recycling as part of its commitment to sustainability. UTTC’s campus-based population of 1,160 – including college students, staff, and youngsters – is of sufficient size that recycling requires organization and promotion. The October drive was promoted throughout campus with posters and electronic messages with the slogan: “Let’s Fill Our Bins to the Brim!” Participants were encouraged to begin using a regular system for collecting two, common recyclables: paper and plastic. The college would like to recycle as much as possible, including aluminum cans. Members of the Green Committee advised how to prepare and separate recyclables. They set up drop-off locations in main campus buildings where they placed recycling totes. 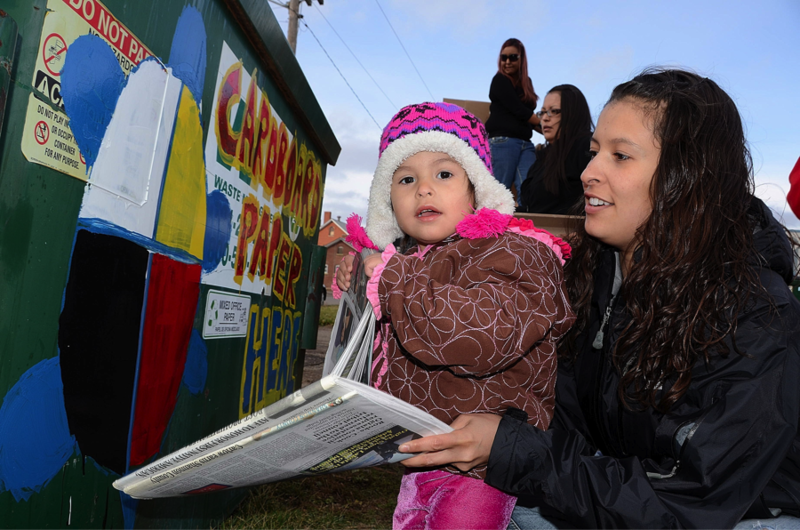 And they invited the more engaged to take their recyclables directly to the large collection bins that were brightly painted with designs and words by youngsters from the college’s elementary school. The event also included a cook-out at the student union and presentations about campus sustainability and the work of the Green Committee. Since United Tribes agreed to the climate commitment in 2010, sustainability has taken on new importance in policy and practice. But the challenges associated with incorporating “Green Energy” are considerable. UTTC is located on the site of a former military post. Most of the brick and wood-frame buildings, constructed between 1900 and 1908, are poor examples of energy efficiency. Over the past decade, all remodeling and new construction has incorporated modern efficiencies, like ground-source heating, energy efficient windows and passive solar design. Signing the commitment and establishing the Green Committee, with representation from departments throughout the campus, signals that green energy is a central part of the college administration’s long-term strategic plan to grow the student population and expand the campus with new buildings and infrastructure. According to Curtis Maynard, Facility Manager, the college is committed to green standards. New campus construction and renovations are planned and built with the U.S. Green Building Council’s (USGBC) LEED Silver standard as a guideline. The two most recent examples are a $1.1 million renovation and expansion of the college cafeteria and the $5.5 million construction of a science and technology building on the college’s new, south campus. Green energy initiatives are moving forward on a number of fronts. The college has adopted an energy-efficient appliance policy, requiring the purchase of ENERGY STAR certified products that have that rating. Family student houses have received new appliances, along with new lighting and other energy efficient changes. A study is underway to compare the energy consumption of houses where retrofitted appliances are in service. Student tenants, and their family members, have been trained to identify good energy usage. As the college upgrades its aging electrical service by changing-out overhead distribution lines to underground, new gas and electric metering is installed for individual buildings. Unfortunately, service to the original military fort did not include separate metering. Also being added are water meters. This will more closely identify consumption and costs. Staff and students in the college’s Tribal Environmental Science Program used a carbon calculator program to perform energy audits and that will help identify areas for improvement. In terms of information and education, the college has hosted Sustainability Days and Earth Day observances. Guest experts have presented talks about energy efficient ideas and policies that can be incorporated on campus. The college has encouraged the use of public transportation; there is a city bus system stop a the college’s main entrance. Clearly the Green Committee understands it has much work to do on sustainability. An important step just ahead is to file the college’s climate action plan with the ACUPCC by January 15, 2013. That planning work is underway now. For more information about the United Tribes Green Committee and the college’s climate commitment, please contact Curtis Maynard, Facility Manager, S/CS, 701-255-3285 x 1638, cmaynard@uttc.edu. Bowie State University has undertaken several endeavors to go “green” and increase its sustainability through its Climate Control Commitment Committee (C4), not the least of which is its partnership with the Toyota Green Initiative to foster sustainable living and thinking among its students. The Toyota Green Initiative (TGI) is an environmental stewardship platform designed to empower Historically Black Colleges and Universities (HBCU) students and alumni on the benefits of adopting a sustainable lifestyle. The success of a Bowie State University and TGI partnership is predicated on both entities’ keen focus on a partnership supported by engaged leadership, which in turn will foster enhanced sustainability awareness at Bowie State University. By its nature a sustainable lifestyle necessitates a change in mindset, thus the acceptance of sustainability practices as routine requires leadership intervention and engagement. Further, the partnership will be foundational for fostering green practices targeting students, faculty and staff at the university. It is within this vein that the launch of the TGI was held during the 2010 Homecoming at Bowie State University, the first stop in a cross-country HBCU tour through a partnership with the CIAA and the BET Black College Tour. As with any institution, leaders must model the way for their followers. In this regard, Bowie State University President Mickey L. Burnim, and Dr. Karl Brockenbrough, Vice President for Administration and Finance, were on hand to welcome John Ridgeway, corporate manager of Toyota Financial Services, and participate in the ribbon-cutting ceremony opening the BSU greenhouse in December 2012. In addition to serving as a learning forum for BSU students specifically and the campus community generally, the greenhouse now serves as a conservatory for nurturing and cultivating flowers for future planting as part of the campus landscape. The ribbon-cutting ceremony was a precursor to a one day, fully immersive TGI event held at Bowie State University, President Burnim and his cabinet members were actively involved in the student-focused lecture series, recycling and other activities relating to sustainability as a way of life, and a greenhouse re-planting activity undertaken during the event. Student groups separated and replanted 87 day lilies and 16 irises, which will yield upward of 250 perennials in the spring for replanting as part of the campus landscape. The outcome of these efforts will serve to decrease the carbon footprint of the campus. The TGI team reported that the recycle drive at Bowie State University resulted in the highest amount of items collected from any particular HBCU during our 2012 campus tour. The successful generation of recyclable material at Bowie State University is unsurprising given that the university has participated in the National Recyclemania competition for the past six years. In addition, the C4 committee, led by Dr. Brockenbrough, has been instrumental in staging Earth Day, Recycle Week, and lectures to move the Bowie State University community toward adopting sustainability as a way of life. These efforts, coupled with the burgeoning TGI partnership, are serving to foster purposefulness in attaining and sustaining green sensibility. The American Association of Community Colleges’ SEED Center Mentor Connect program pairs best-in-class green colleges with “mentee” colleges in an effort to more swiftly enhance programs that prepare students for careers in clean energy and green fields. 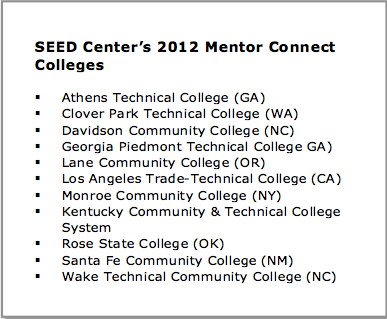 The SEED Center created this pilot mentoring project in response to a growing demand from its 471 colleges seeking more in-depth technical assistance. “We realized the best way to replicate some of the great sustainability-related practices we were finding on college campuses was through a structured program that would leverage the expertise of our growing pool of community college experts and create peer-to-peer networking opportunities,” said Todd Cohen, director of the SEED Center. Mentee colle ges created project plans and outcomes and secured senior administrative support for their participation. Mentors were matched with mentees based on need and fit and over a period of nine months engaged in a series of working conference calls and, in some cases, site visits. Actions focused on a range of clean tech workforce development and broader sustainability curriculum efforts. Some colleges devised strategies to more effectively engage regional employers in current or new program design while others began college-wide efforts to embed sustainability concepts into core curriculum. The pilot project has created some significant early successes including a coordinated 14-college effort in Kentucky to train automotive faculty to infuse hybrid and alternative fuels technologies into their programs. While the peer-to-peer technical assistance has been effective, it is the potential for these partnerships to become long-term relationships that is most exciting. 1) Identify new appropriate building science and alternative energy programs, and; 2) Grow enrollment in MCC’s newly developed Solar Thermal Certificate, including identifying new certificates that will be fully transferable into existing HVAC and construction technology degree programs. MCC is now implementing a strategy used by several community colleges, including Los Angeles Trade-Technical College, to leverage industry certifications and competencies creating “stackable” certificates with career pathways. With this model, students complete aligned foundational competencies and receive academic certificates and/or industry certifications which can be “stacked” into an associate’s degree. The model, which has proven to be successful in helping student achievement, has only just begun to be adapted to sustainability-related industry sectors. 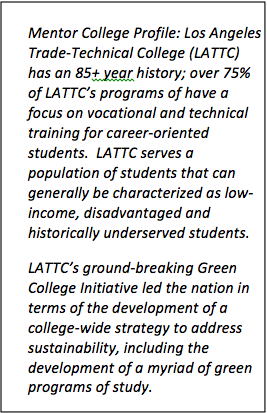 In a series of conversations, LATTC mentors worked with MCC staff to use LATTC’s forthcoming tool Defining Your College’s Competitive Advantage in the Emerging Green Economy: A Blueprint for Building High Quality, Green Programs of Study. The tool helped MCC assess external factors—from industry incentives to state policy to their community appetite for sustainability—that would likely determine which clean tech industry sectors might be high-growth sectors, and thus, worthy of further college training investment. MCC has now set a path to adapt its new solar thermal technology certificate program to prepare students to become technicians skilled in the design, installation and maintenance of renewable energy systems. MCC’s certificate program offers a curriculum that reflects industry standards and provides a pathway to an A.A. S. degree in heating, ventilation and air conditioning/refrigeration. 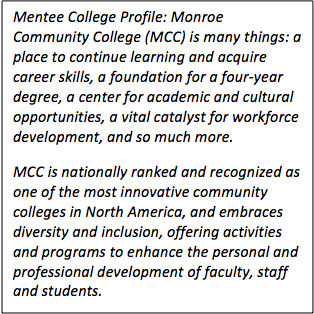 The connections forged as part of the Mentor Connect cohort enabled MCC to evaluate new programming opportunities and to create continuing connections between the two colleges. LATTC program chairs will share curricular materials with MCC departments to assist MCC as they revise and adapt their renewable and clean energy curriculum. 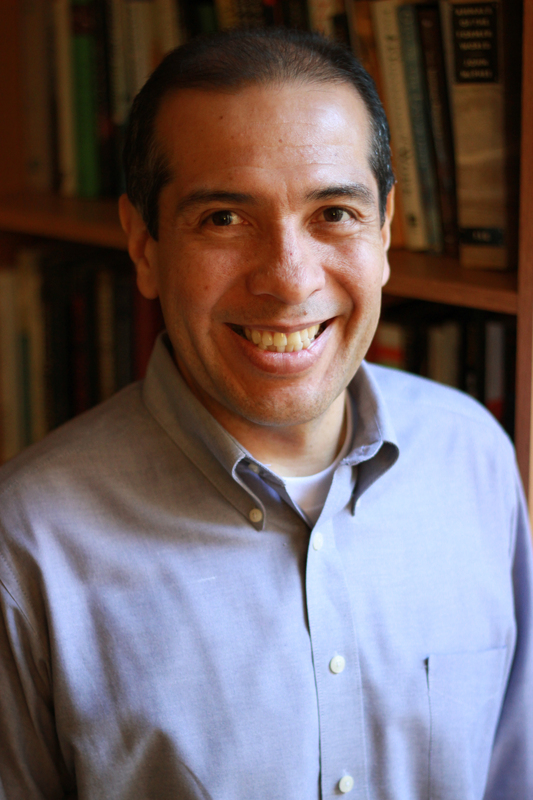 My name is Jairo Garcia and I am thrilled to be part of the Second Nature team as the ACUPCC Implementation Fellow. My primary responsibilities are to assist and support Minority-Serving Institutions (MSIs) and Under-Resourced Institutions (URIs) signatories of the ACUPCC to advance your institution’s commitment to carbon neutrality, implement sustainability practices in curricular initiatives and support your community partnerships. Also joining the Second Nature team is Axum Teferra. Axum is the ACUPCC Recruitment Fellow, and will be sharing responsibilities in providing implementation support. Our positions were made possible by The Kresge Foundation through Second Nature’s “Sustainability Leadership, Capacity Building and Diversity Initiative”. I would like to share my journey that has led to my passion for education for sustainability. I grew up in an economically challenged neighborhood in Bogota, Colombia, surrounded by drug dealers and violence. I vividly remember the sole tree almost a mile from my house and the Bogota River, infamously recognized for being one of the most polluted rivers in the world. These were my only two contacts with nature in the middle of Bogota’s ever-expanding urban metropolis. To escape from the glooms of my reality, I submerged myself in books and dreamed about a better world where we all could live and prosper with dignity and in harmony with nature. My family had little opportunity to finish high school, much less college, and perhaps this was the reason for not being supportive when I told them about my desire to study physics after being accepted at the National University in Colombia. They believed that physics was a futile profession and our economic situation was too precarious to pursue years of study. My only option at that time was to enroll in a technical institute. After obtaining a technical degree, I was able to find a full-time job and make enough money to help my family and to enroll in a big university to further my education in engineering. My graduation thesis at the technical institute received prestigious recognitions and after completing my engineering degree, I was offered the opportunity to work for a Colombian company in New York City. To obtain USA professional credentials, I pursued in evenings a Telecommunications Certification program at La Guardia Community College. This program allowed me to find a job with a multinational organization in the heart of Manhattan. A few years later, I completed a Master’s in Network Management from Syracuse University. In 2000, I moved to Atlanta, GA for a consulting position with a Fortune 100 company. For almost a decade, I worked as an engineering consultant, managing projects in more than 25 countries. It was through these numerous travels that I came to the realization that environmental degradation is not limited to Bogota or New York, but it is evident across the globe; polluted air, rivers, and oceans, species pushed to extinction, thousands of acres of land turned into deserts, and noticeable extreme poverty even in the wealthiest countries. The breaking point occurred while visiting a beverage plant in Lima, Peru. Their installation, protected by guards in military uniforms with machine guns, was located next to a waterless river packed with garbage. The closeness of that beverage plant to a dry river was a surreal image that brought flashbacks from my childhood and changed my mind forever. I decided to become part of the solution by dedicating my professional efforts to making contributions for the construction of a just and sustainable society. During this time I was pursuing a doctorate in technology, but after my trip to Peru, I switched my topic to sustainability in higher education. My focus was on universities in Costa Rica because of their leading role in sustainability education in developing countries. As a byproduct of my research, I was able to create awareness at many universities in Costa Rica about the critical need to prioritize resources for sustainability in education. I was able to present the results of my research at the AASHE Annual Conference in 2010. Although sustainability should be taught at all levels of education, the critical condition of our planet requires immediate action. Higher education institutions are in a privileged position because of their intrinsic function to form our next generation of scientists, educators, and decision makers. As such, these institutions play a fundamental role in changing our path from degradation to a sustainable future, in which all humans should be able to live and prosper in harmony with each other and with the rest of the natural world; however, this education must be carefully designed. David Orr, distinguished Professor of Environmental Studies and Politics at Oberlin College, stated that without significant precaution, “education can equip people merely to be more effective vandals of the earth”. This education, according to Orr, must include principles of social-economic and environmental values and ethics, “a commitment for the preservation of life and an attachment to health, harmony, balance, diversity, peace, participation, and justice”. My passion for sustainability in education lead me to the Earth Institute at Columbia University as a Research Intern Associate. One of my functions was to assist the Institute in the development of curricula in the areas of sustainability metrics and climate change adaptation. I also completed a Masters of Science degree in Sustainability Management, served as the Vice President of Academic Affairs for the Student Association, was employed as a teaching assistant for two Earth Institute graduate classes, was co-founder and special advisor for the Columbia University Coalition for Sustainable Development, collaborated in the organization of the New York+20 conference, and worked closely with Earth Charter International, for which I presented a webinar about sustainability education and the ethics of sustainability. Last year, I was the recipient of the Columbia University Innovation Scholarship Award, which is awarded only to those who have demonstrated a commitment “to transform knowledge and understanding in service of the greater good, defined as a just, sustainable, and compassionate global society”. It is clear to me, that this professional journey could not have been possible without the support of those small and under-resourced institutions that helped me in the moments when I needed them the most. I truly feel a moral obligation to give back to them. Thanks to the Kresge Foundation grant, the Recruitment Fellow and I will be able to fully dedicate our time in providing capacity building opportunities and implementation guidance to these institutions in their efforts to achieve carbon neutrality. We will also be able to assist these institutions with implementing programs in sustainability in order to provide their students with the tools, knowledge, and ethics necessary to construct a just and sustainable future for all. Please feel free to contact me at any time at jgarcia@secondnature.org. The University of Maine has launched a new National Science Foundation sponsored Integrative Graduate Education and Research Traineeship (IGERT) – the first of its kind to focus explicitly on adaptation to abrupt climate change (A2C2). The A2C2 IGERT is a partnership between the Climate Change Institute (CCI) and the School of Policy and International Affairs (SPIA) and is focused on the need to adapt environmental policies and management strategies to meet the social and ecological challenges caused by abrupt climate change events. The program is funded by a five-year, $3 million award from the National Science Foundation, and will support the research of 24 Ph.D. students in Earth sciences, ecology, economics, anthropology and archaeology. Their research will focus on the effects of abrupt climate change on global security, ecosystem sustainability, and the integrity of economic, social, political and ideological systems. Abrupt climate change (ACC) refers to the surprisingly rapid and dramatic shifts in regional and global climate that have occurred numerous times during Earth’s history, but which have only been well documented and appreciated by the scientific community over the past several decades. Although the phenomenon of ACC is well established scientifically, is not widely understood by policy makers, planners, or the general public. The A2C2 IGERT therefore features a novel training program that emphasizes equal participation by the natural and social sciences and fosters enhanced understanding of the dynamics of coupled natural and human systems in response to ACC. The primary goal of the A2C2 IGERT is to train a new generation of scientists who possess the skills and attitudes needed to meaningfully address the environmental and social challenges of ACC. In addition to conducting collaborative interdisciplinary research, A2C2 students will participate in policy and management internships with international groups , federal and state agencies, non-governmental organizations, and private corporations. 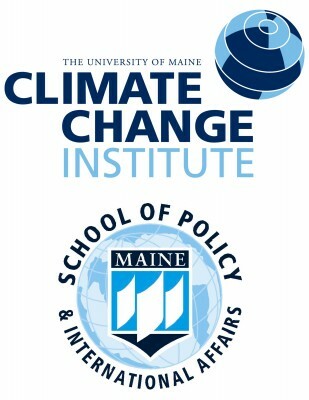 In so doing, they will become experts and leaders in their fields, understanding the dynamic relationship between the environment and the security of humans in response to ACC, says Dr. Jasmine Saros, associate director of UMaine’s Climate Change Institute and the principal investigator on the project. The program is also designed to train leaders and experts who will make significant professional contributions in facilitating a paradigm shift in the way that policy makers and managers conceptualize climate change, so that the threats and opportunities associated with rapid shifts in regional and global climate are explicitly acknowledged in societal planning. In other words, we hope our students will ultimately persuade planners and managers to rethink their assumptions about how Earth’s climate has functioned in the past, and to reexamine their ideas about how this surprisingly temperamental system might respond to current and future levels of human influence and disruption. The A2C2 IGERT also hopes to challenge the commonly held view that the past 11,000 years –during which human civilization arose – has been a period of remarkable climate stability. In light of the best and most contemporary scientific evidence that we possess, this notion of global climate stability during the rise of civilization appears to be deeply flawed, since we now know that numerous ACC events occurred during this time. Although these events were certainly milder than those that occurred in the more distant past, they were nonetheless quite dramatic by modern standards and were more than adequate to severely disrupt a variety of civilizations and ecosystems by way of extreme and prolonged drought, dramatic sea ice expansion, increased storminess, and increased frequency and magnitude of freezes. We also know that numerous societies failed catastrophically during these events. We believe that the lessons learned from investigations into these events are of clear value to contemporary societies, since rising atmospheric concentrations of greenhouse gases will likely create the persistent, looming threat of abrupt and highly disruptive climate shifts in our future. The good news, of course, is that although many societies collapsed during periods of abrupt climate change, many others found ways to flourish. We should therefore resist the temptation to view ACC events in an apocalyptic light; although they present significant challenges to societal well-being, they also present a wide variety of opportunities for societies that can find ways to reduce vulnerability and increase resilience. UMaine is very excited to have received this IGERT award, the third in our university’s history. The IGERT program is now the National Science Foundation’s flagship interdisciplinary graduate training program, and is well aligned with the ACUPCC’s goal of curricular transformation. IGERT strives to catalyze a cultural change in graduate education by establishing innovative new models that transcend traditional disciplinary boundaries, by facilitating greater diversity in student participation and preparation, and by contributing to the development of a globally-engaged science and engineering workforce. Since its inception in 1998, the IGERT program has made 215 awards to over 100 leading universities in 41 states, the District of Columbia, and Puerto Rico. IGERT has provided funding for nearly 5,000 graduate students. To learn more about the A2C2 IGERT at UMaine, please visit our program website or contact Misa Saros, A2C2 IGERT Program Coordinator, at misa.saros@umit.maine.edu. General inquiries can also be sent to a2c2igert@umit.maine.edu. There has never been such a critical need for educating today’s undergraduates on Earth’s changing climate and pathways to sustainability. The footprints of climate change surround us – Arctic sea ice reached its record lowest extent in August 2012, the 10 warmest years in the global climate record have occurred since 1997, and global sea level continues to rise (1). Climate change is also predicted to increase the frequency of extreme weather events, which combined with sea-level rise, may lead to more natural disasters such as Superstorm Sandy (1, 2, 3). It is imperative to develop a scientific workforce ready to tackle the challenge of climate change in light of the new energy economy and various societal and political factors. The National Science Foundation (NSF) underscores the need for increasing public literacy in the Earth System Sciences, including climate science literacy, and preparing a highly skilled scientific workforce reflecting the nation’s diversity (4, 5). To promote climate science literacy and geoscience diversity, NSF is supporting a long-term partnership between Second Nature and the American Meteorological Society (AMS) Education Program that will introduce the AMS Climate Studies course to 100 minority-serving institutions (MSIs) over a five-year period (6). AMS is now enrolling 25 MSI faculty members to attend the expenses-paid Course Implementation Workshop in Washington, DC, from May 19-24, 2013. The Implementation workshop leverages the expertise of NASA, NOAA, and Howard University climate scientists, as well as faculty from George Mason University and James Madison University, both signatories to the American College & University Presidents’ Climate Commitment (ACUPCC). The 2013 AMS Climate Studies Diversity Project informational website and application form are available online. The deadline for application is March 15, 2013. The AMS Climate Studies Diversity Project aligns with the goals of the ACUPCC and supports the diversity initiatives of Second Nature. The AMS-Second Nature partnership is enabling signatories to strengthen the curriculum component of their ACUPCC Climate Action Plans. Faculty members representing 28 MSIs attended the inaugural Course Implementation Workshop in May 2012 and are introducing the climate course at their local institutions this academic year. The 2012 cohort included 9 signatory MSIs: California State University Monterey Bay, Coppin State University, Delaware State University, Jones County Junior College, Monroe Community College (NY), Morgan State University (MD), New Mexico State University, New Mexico State University – Grants Campus, and South Mountain Community College (AZ). AMS Climate Studies is a course package available to undergraduate institutions nationwide. The course can be offered by science faculty with a range of backgrounds, within various learning environments from face-to-face to online instruction. Developed by AMS staff scientists and science educators, the course includes a comprehensive 15-chapter textbook, an Investigations Manual with 30 laboratory-style activities, a course website containing current science investigations and real-time data, and a faculty website and resource CD. Course activities and test banks are provided in Respondus format that can be ported into a course management system for automated scoring and immediate student feedback. Faculty fit the course into different departments and levels depending on their local college requirements. For example, Professor Constance Falk of New Mexico State University plans to first offer the course in spring 2013 as a senior level honors class. She explains that “the course will be open to all majors and focus on science, policy, and politics.” Professor Chunlei Fan of Morgan State University first offered the course as a “498” internship class in fall 2012 and awaits full course approval. Professor Szymanski has the 4-credit sequence of Climate Change with a laboratory approved at a 200-level. Many others implement the course at the introductory undergraduate level.